For those who have spent any time in India (or even in Indian restaurants! ), the popularity and ubiquity of lushly-illustrated images, especially of gods and goddesses, is impossible to ignore. 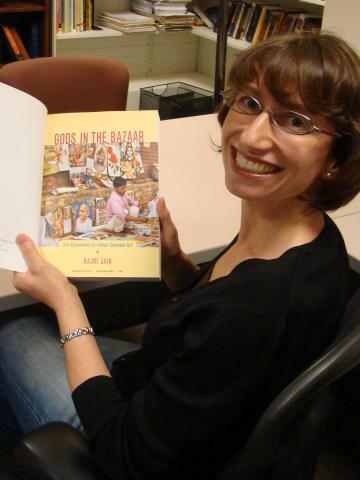 I picked up Kajri Jain’s Gods in the Bazaar: The Economies of Indian Calendar Art (Duke, 2007), in the hopes of finding a history and analysis of this contemporary art form that I could sink my teeth into. I also wanted to see if it would be appropriate for assigning in my course on “Politics and Popular Culture in Twentieth Century India,” which I will be teaching again in Fall 2009. Jain’s highly sophisticated and densely argued analysis may be daunting for some students, but it is extremely rich, thought-provoking, and rewarding. Focusing on the production, consumption and circulation of these images, and the meanings that they generate, “as sacred icons, commodities, gifts, items of ritual exchange, and items of libidinal investment” (p. 18), Jain offers a finely-textured account of contemporary post-colonial modernity in India-its complex participation in a global capitalist economy, and the concomitant forms of aesthetics, ethics, corporality and sacrality that shape the vibrancy of everyday life.